I don't generally blog about social media on here but I genuinely love it. And not just because I love keeping up with old friends or that fact that my cousin is traveling the world and documenting her adventures on Instagram. Here's her account; worth checking out but warning you will get jealous. Whatever drew me to PR as a profession also created my love of social media. I find it fascinating. I love that at 23, I've seen just about countless iterations of Facebook from 2006-2016. I joined 2 years after it got started and it's not even remotely the same social media platform anymore. I love watching it adapt and change. I love seeing new platforms pop and then predicting which ones will make it and which ones won't. I'm also really interested in the analytics of it. Like how Facebook posts with pictures get seen more and get more likes. It's fascinating how Facebook curates our content and then conditions us to post the types of content it prefers. I like figuring out what percentage of likes most accounts get on Instagram. Or why tweets from unknown people's accounts go viral. I love it. And now there's something new to talk about. Instagram stories. In a nutshell, Instagram Stories allows users to post a picture that disappears after 24 hours. Sound familiar? That's because it is. It's the same basic set up as Snapchat stories. Some people are getting really upset because "Instagram is stealing snap chat's idea" and "really Instagram, come up with something original." To the first phrase, I would like to remind people of the fact that Instagram used to only be pictures but now it's pictures and videos. Do you happen to remember when videos came into the Instagram picture (pun fully intended)? Because I do. It was shortly after Vine blew up. Whoever runs Instagram realized, "oh, people like pictures and videos. We should give them space for videos here." So they did and people love that feature and use it regularly. Videos are used in a different way than people used Vine but it was still blatantly copying right down to the short video length. So this isn't the first time Instagram has copied someone else's idea. Even Instagram's direct messaging feature seemed like a copy of Snapchat originally. In fact, they aren't even the only social media platform to copy ideas. Facebook Live wasn't a thing until after Periscope got big. Hashtags were created for Twitter and now they're on every social media platform with a search option. Why reinvent the wheel when it already rolls just fine? So much of the products in our society are copycats of something else. My dad is always complaining about how all vehicles look pretty much the same and that there's no originality in car design. He's not wrong. Granted there are a few cars that don't look like every other car on the planet. But you know what, he hates them, thinks they're ugly. Which says something, doesn't it? If I'm the CEO of Instagram or Toyota, why would I risk time and development on a new idea that everyone very well could hate when I could just make my own adjustments to something I know people are comfortable with. It's a pretty easy decision. If I want to keep making money and insure my profits, I don't go for something new; I go for something tried and true. Here's my response to the second statement. Instagram Story is not original. It's not even pretending to be original, but then there's nothing new under the sun. It doesn't need to original to be worthwhile. I think it was a super savvy move by Instagram. It could fizzle out and in a few months I'll look dumb for applauding them but I don't think it will. It has a lot to offer even though people are initially resistant to change. Here's what Instagram Stories has to offer that Snapchat doesn't and can't offer: it's on Instagram. It's that simple. You don't have to leave Instagram to watch your favorite artist paint or see the behind the scenes of a photographer. You watch right there. All you have to do is click follow once. You don't have to find the Snapchat username and type it in exactly right and click "add friend." It's all right there at the top of your screen when you get on. In addition to being convenient, it gives you the option to see little day to day snippets from accounts that you don't necessarily want to follow on Snapchat. Other ways it differs from Snapchat is by showing content from people you tend to engage with first and allowing you to go back or pause a story. I love the fact that you can pause a slide or jump back to the one before it. How useful is that! However, with that being said, I don't think Instagram is going to kill Snapchat. 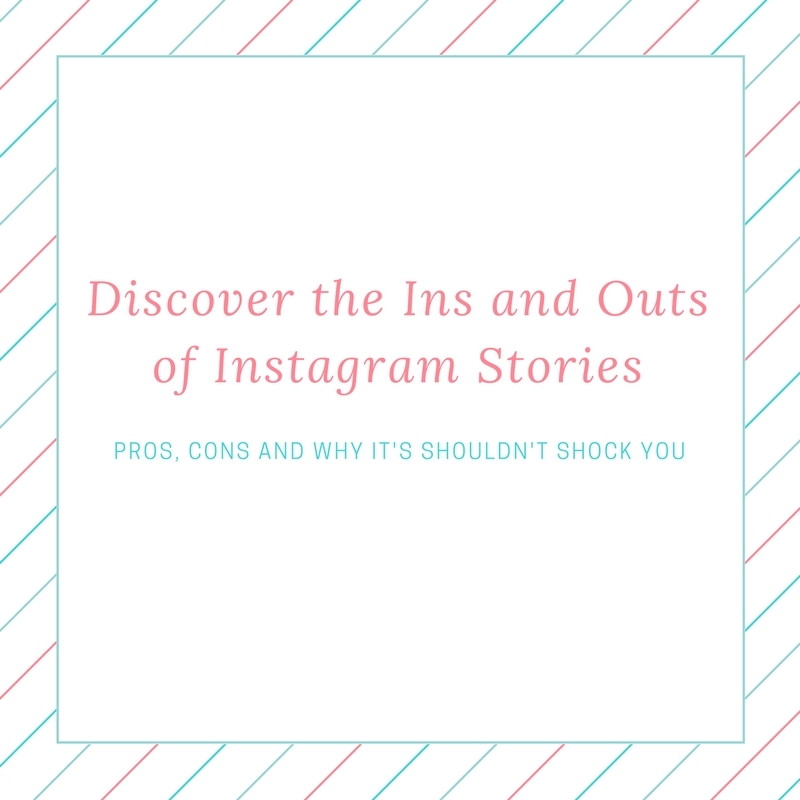 I think people who don't use Snapchat will use IG Stories and maybe people who use Snapchat stories will use Instagram Stories in a slightly different way. Right now it seems like a straight rip off of Snapchat but in a few months it will evolve to be its own thing that we all love and have forgotten ever complaining about. Promotion: Specifically promotion of something that is a work in progress. While working on this during my lunch break, I just posted a picture of my computer screen with the caption, "Working on a blog during my lunch break. I'm excited to share." People already knew something was coming before I could share the finished product. So enjoy the challenge of learning a new social media platform and fondly think back to when your Facebook status option were "Jackie is... At home, at work, at school." Ahh the good ole days.